Powo (Tib. སྤོ་བོ་, Wyl. spo bo) aka Puwo (Tib སྤུ་བོ་, Wyl. 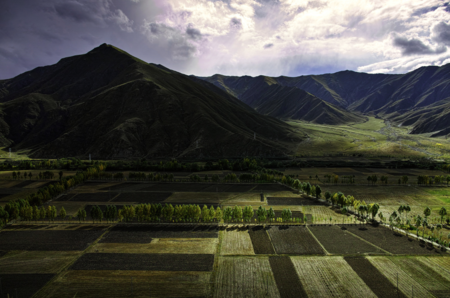 spu bo ) is one of the three main regions comprising South Eastern Tibet. Until the early twentieth century Powo was a virtually independent kingdom. Powo is the easternmost of these three regions, located in the Tibetan Autonomous Region and close to India’s Arunachal Pradesh, Myanmar, and Yunnan Province . Approximately two thousand years ago, the Tibetan king Drigum Tsenpo (the 8th in the line of the original rulers of Tibet) was assassinated by his minister Longam. The king three sons—Jatri, Shatri, and Nyatri—fled. Jatri settled in the Powo area and ruled as king. He and his descendants later came to be known as the Kanam Depa clan. They ruled Tibet’s southern-most regions, centered in Powo but including Pemakö and other valleys, for almost two thousands years. They subdued outlaws and extended their loving protection to the weak, thereby gaining a very special place in Tibetan history. They were Dharma patrons mainly for the Nyingma and Kagyu schools and in particular for the great Nyingma tertön Rigdzin Düddul Dorje, Taksham Nüden Dorje, and Tsasum Lingpa. When the Mongol-backed king of Tibet Chögyal Pakpa (1235-1280) travelled through the region he empowered the local head lama to become the ruler of the region, furnishing him with a royal proclamation and seal. This lama’s cousin, Pöngen Anyak (dpon rgan a nyag), was the driving force behind the actual unification and expansion of Powo. He brought outlying areas more directly under the control of his family and instituted a system of tax collection. In the early fourteenth century Pöngen built a castle for his lineage called Kanam Sinpo Fortress (kaH gnam srin po rdzong) and founded the kingdom of Powo, making himself the first king. The kings of Powo used the title Kanam Gyelpo (kaH gnam rgyal po) or King Kanam Depa (Wyl. kaH gnam sde pa). The rise of the Gelugpa state in Lhasa under the Fifth Dalai Lama drew Powo into trans-regional politics and sectarian conflicts. For example, when the Fifth Dalai Lama deployed Mongolian troops to southeastern Tibet to root out the Karma Kagyü, Powo was invaded because the Kanam Gyelpo was a benefactor of local Karma Kagyü monasteries. The twenty-first Kanam Gyalpo was quick to learn how to work with the new authorities in Tibet, integrating Powo into the economic and cultural life of the important Gelug monasteries around Lhasa by building the Powo Regional House (spo bo khang tshan) at Sera Monastery. The twenty-first Kanam Gyelpo was also an astute politician, skillfully partaking in the emerging wealth and power of the large Gelukpa monasteries around Lhasa while not sacrificing the independence of Powo to the Ganden Palace (dga’ ldan pho brang). He was also somehow able to avoid having to pay taxes to the Tibetan central government. In the early twentieth century the twenty-fifth king abdicated the throne and became a monk. Succession problems ensued and violent conflicts broke out between certain monasteries. This led to an intervention by joint Lhasa and Qing military forces and a restructuring of the governance of Powo. From this point on Powo was obliged to pay yearly taxes to the central government in Lhasa. In 1911, Chinese soldiers who had been left behind in Tibet began to plunder their way back to China. The people of Powo and their monasteries were ravaged in the process. Lhasa seized this opportunity to take control of Powo and it lost its independence. ↑ In many older sources, Powo is called Puwo, which is a reference to its ancient connections to the Purgyel (spu rgyal) dynasty that ruled Imperial Tibet. ↑ Khenpo Tsewang Dongyal, Light of Fearless Indestructible Wisdom: The Life and Legacy of H. H. Dudjom Rinpoche, Snow Lion 2008, page 61. This page was last edited on 27 April 2017, at 06:21.